SLIGO, Pa. – The Country Springs Personal Care Home was recently named Personal Care Home of the Year by Affinity Health Services, Inc., a senior management and consulting organization contracted to oversee the day-to-day operations at Clarview Nursing and Rehabilitation Center and Country Springs. Affinity recognizes annually the achievements of their senior living communities. There were numerous awards and recognitions presented throughout the two-day event, the 2019 Affinity Days. With an extensive, thorough review of multiple areas of operations, Affinity presented certificates of recognition to the Skilled Facilities, Personal Care Homes and Independent Living communities. 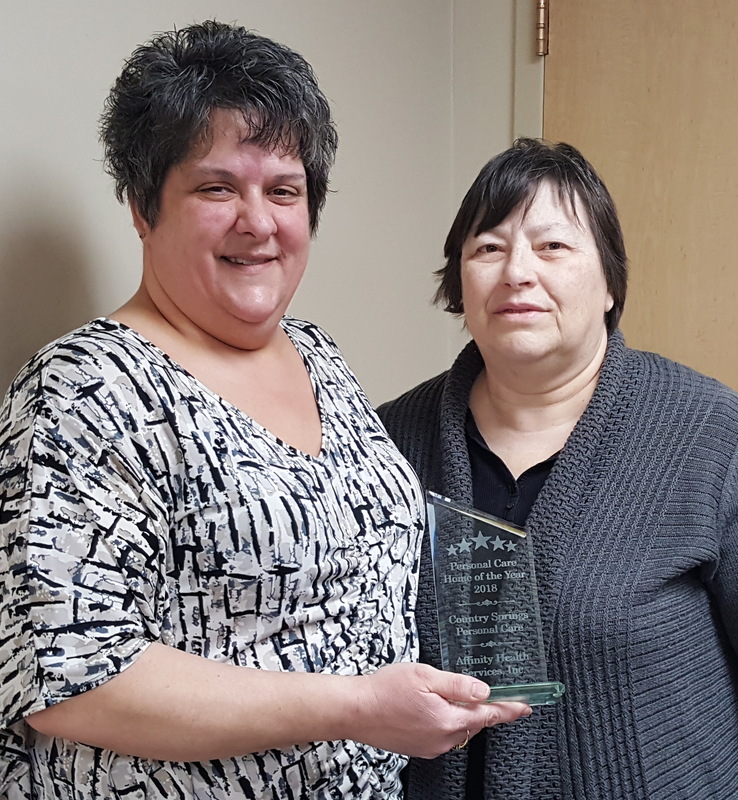 Mindy Gatesman, administrator at Country Springs, and Barbara Barger, president of the Clarview Board, accepting the award. Country Springs received awards for outstanding survey performance, exceeding occupancy expectations, various personnel, and other quality and operational excellence challenges for 2018’s performance. Mindy Gatesman, PCHA (Personal Care Home Administrator), has been the administrator at Country Springs since 2017 after spending 18 years at Clarview as the Director of Admissions and Marketing. With staffing challenges in the ever-changing health care field, Country Springs was blessed with no employee turn-over during 2018. The annual Affinity Days Conference was held in State College at the Penn State Nittany Lion Inn. This two-day retreat involved a full agenda designed to be beneficial for each community represented at Affinity Days. The event was launched by outlining this year’s dedication and commitment to being Proactive and Open-minded, along with Elevating the direct caregivers while maintaining full Transparency (POET). The keynote speaker was Clint Maun, a nationally recognized speaker who shared his innovative expertise within the healthcare industry. His presentation included methods to cultivate a philosophy with renewed motivation, a focus to develop positive approaches with actions, and implement results-oriented changes to bring senior living communities to a new level. Gatesman said the award was a complete surprise and very humbling, and it wouldn’t have been possible without her staff. The Clarview campus is conveniently located minutes from Clarion and Shippenville at 14663 Route 68 in Sligo. To explore more about the specialized services or career opportunities offered at Clarview Nursing & Rehabilitation Center and Country Spring Personal Care, call 814-745-2031 or visit their website at www.ClarviewNursing.com. They also invite you to follow them on Facebook to discover the various life enrichment activities that taking place at Clarview campus.